This is one of those situations where function is definatley more important than form. 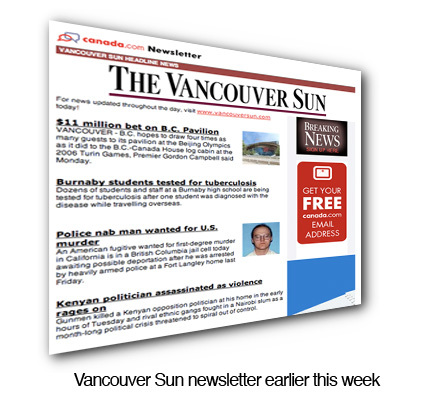 I get a daily enewsletter from the Vancouver Sun, and have for a while now. There are usually a couple of stories I’m interested in, so I’ll follow the links in the newsletter and get the story on their web site, which is of course part of the Canada.com portal. 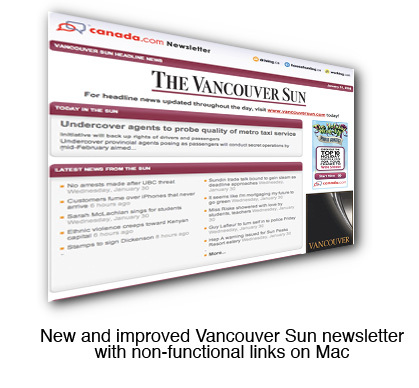 Yesterday the Sun rolled out a new design for their enewsletter – and for anyone using Mail on a Mac – there’s a bit of a problem. The links don’t work. Clicking on any of the story links just reloads the page, and you never get to the story. Now, its true, enewsletters are a bit of a nightmare, since how they look and function is totally dependent upon the mail program at the other end. The same is true for web sites, but with mail, there are even more issues than with multiple flavours of web browsers. Its seems odd though, given this is coming from a newspaper company. Print media in general are Mac shops – or at least heavily weighted with Macs. Its interesting this slipped by the developer, because the entire function of an email newsletter is to get you to follow the links. No links ? What’s the point ? Oh well, guess I’ll strike one more ‘traditional media’ company as a source for information – at least for now. I have to give Sun editor-in-chief Patricia Graham big points. I emailed her, along with the web folk at Canada.com this morning, explaining the issue. She was the first to reply, within an hour, saying it’ll be looked at.